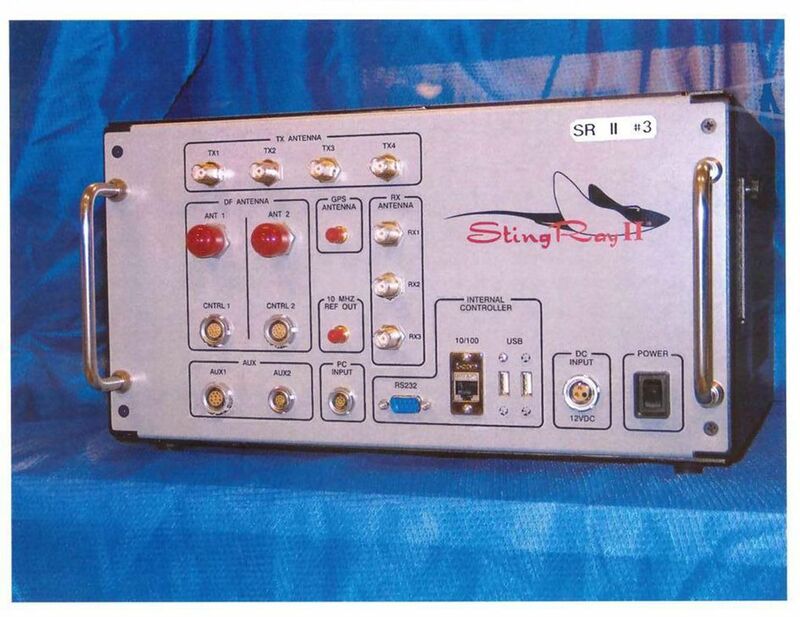 This suitcase-sized device, called Hailstorm or Stingray, is a controversial cellular phone surveillance device manufactured by the Harris Corporation. It is designed to sweep up basic cellphone data from a neighborhood and identify unique subscriber numbers. That data is then transmitted to the police, allowing them to locate a phone without the user even making a call or sending a text message. It’s the newest, most advanced technology in spyware which essentially allows police to observe, record and otherwise pinpoint your cell phone activity. And, of course, a growing number of police departments are purchasing these devices. Stingrays cost as much as $400,000 and acts as a fake cell tower. The system, typically installed in a vehicle so it can be moved into any neighborhood, tricks all nearby phones into connecting to it and feeding data to police. In some states, the devices are available to any local police department via state surveillance units. The federal government funds most of the purchases, via anti-terror grants. These devices are used to spy on people’s words, locations and associations. Stingrays can capture everything from metadata (who called whom, when, and sometimes from where) to the content of calls. A news article from USA Today titled, Cellphone Data Spying: It’s Not Just the NSA describes how numerous police agencies across the country refuse to admit whether they’ve used Stingrays in surveillance. According to the article, most police agencies deny public records requests, arguing that criminals or terrorists could use the information to thwart important crime-fighting and surveillance techniques. Police maintain that cellphone data can help solve crimes, track fugitives or abducted children or even foil a terror attack. The American Civil Liberties Union (ACLU) has investigated the use of Stingrays and has also successfully identified 54 agencies in 21 states and the District of Columbia that own Stingrays. Many agencies continue to shroud their purchase and use of Stingrays in secrecy. A growing number of courts and legal authorities are increasingly wary on whether Stingrays violate citizen’s rights against unlawful search under the Fourth Amendment to the U.S. Constitution. For example, in FROM SMARTPHONES TO STINGRAYS: CAN THE FOURTH AMENDMENT KEEP UP WITH THE TWENTY-FIRST CENTURY? attorney Brittany Hampton wrote a Note in the University of Louisville Law Review which discussed the questionable use of the Stingray devices by police agencies. In her article, Ms. Hampton argues that individuals have a reasonable expectation of privacy in their movements when using their cellphones; therefore, the use of the Stingray constitutes a search within the meaning of the Fourth Amendment. She also discusses the need for the United States Supreme Court to develop a clear warrant requirement for the monitoring of an individual using the Stingray device. Ultimately, Hampton advocates a warrant requirement for utilizing the Stingray devices for police tracking purposes because the warrantless use of the Stingray is an unreasonable search under the Fourth Amendment. My opinion? I wholeheartedly agree with Ms. Hampton, the ACLU and other legal experts on this issues. Using Stingrays is an unlawful search. Quite frankly, the government should not have carte blanche secret access to people’s cell phone use and information. It’s overly intrusive and distasteful that the government can, without warning, essentially use people’s cell data as pretextual evidence to investigate our whereabouts, listen to our conversations and ultimately charge us with crimes. Even worse – and speaking as a criminal defense attorney – it’s disturbing that police agencies can use the information obtained from Stingrays as probable cause to obtain search warrants of people’s homes and seize evidence therein. Moreover, if I move to suppress the evidence gained from the search warrant as the fruits of an unlawful search, local police agencies deny and circumvent my Motions to Compel Evidence and Public Disclosure Requests by simply having the feds conduct the Stingray search. This is bad.